John’s Lumber began in 1947, and Lumber has been a part of our being from the very start. In Metro Detroit, John’s has supplied the material to build thousands and thousands of homes, garages and businesses. Maybe even yours! Customers have driven out of their way to buy lumber at John’s because they can count on superior products, sold by people who know what they are talking about. Buying lumber from a real lumber yard has many advantages. Loading lumber on a cart and pushing it through a checkout lane isn’t how lumber should be purchased. Picking through the last persons rejects doesn’t make much sense either! John’s Lumber offers the customer service you deserve. John’s Lumber stocks the superior material your job deserves. There’s a reason people choose a local lumber yard over the big box stores, and that’s knowledge and superior product. You don’t stay in business that long without offering great products at a great price, with customer service that can’t be beat. Friendly staff, expert knowledge on all kinds of projects, and the best lumber around, we do our best to stand out, and you’re sure to see the difference as soon as you walk in the door. 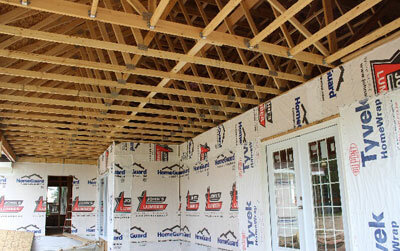 High-performance LP® SolidStart® I-Joists are stronger pound for pound, straighter and more reliable than traditional lumber, with reduced moisture content for floors with fewer pops and squeaks. LP® SolidStart® LVL (laminated veneer lumber) has consistent dimensions and density and is stronger and straighter than traditional lumber. Pound-for- pound, LP SolidStart LVL has more load-carrying capacity than common grades of sawn lumber, making it ideal for beams, headers and other primary load carrying members. When utilizing structural products like I-joists and LVL’s, connecting them together is very important. John’s Lumber stocks a variety of Simpson Strong-tie Connectors covering the common usage in our area. Dimensional Lumber is lumber specifically meant for building and includes your typical 2×4’s, 2×6’s, and 4×4’s, at varying lengths, as well as other cuts that are less common. EWP or Engineered Wood Products are made by binding the wood fibers together with an adhesive to create a composite board that offers higher flexibility, durability, and structural strength. EWP is the eco-friendly choice, as well as the go to for structural designs that will not be seen. For external wood, we recommend a more attractive wood like cherry or walnut. The word “hardwood” refers to all of your typical American woods, such as oak, ash, cherry, maple, and poplar, and are considered to be more durable, which is why they are heavily used in cabinets, doors, flooring, and trim work. Each wood has varying degrees of color, texture, and grains that offer a wide variety of options when choosing the right wood for a project. Plywood is made from gluing together thin veneers to make a composite material used in structural components of a project. The adhesive makes plywood very strong, durable, and warp resistant. Cedar is a naturally long lasting and warm colored wood that is commonly used in doors, decks, and cabinets. Cedar is extremely moisture resistant, which is why it is so popular in outdoor projects. Cedar is also extremely resistant to rot and warping, as well as insects, which is why it is one of the most popular choices for decks. Treated wood is the go to for outdoor wood projects such as fencing, decks, or benches. 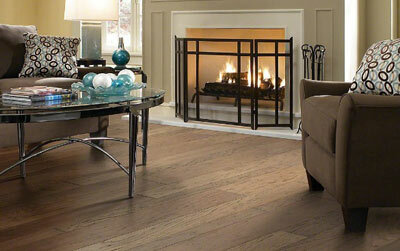 Pressure treated wood is designed to be almost totally resistant to bugs, and built to last for many years. Untreated wood used in outdoor projects tends to feel the effects from weather and bugs much quicker than pressure treated or cedar. Softwood vs Hardwood: Softwood is abundant, cheaper, and easier to access than hardwood, and comes from trees like pine, spruce, and cedar. Softwood is most commonly used in framing for a house or deck, rather than on the exterior, where moisture and damage can occur more easily. Pressure Treated Lumber: Due to the fact that softwoods are susceptible to moisture and rotting, any softwood that will be exposed to the elements is usually pressure treated with a chemical that is meant to preserve the wood. 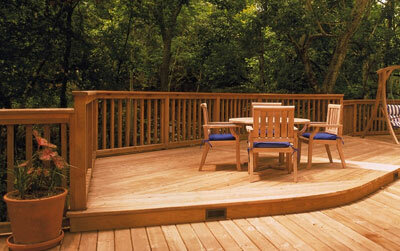 Pressure treated wood is most commonly used in things like picnic tables, mailbox posts, and decks. Because softwoods are susceptible to rotting from water and fungus, softwood lumber that will be exposed to the elements is often pressure treated with a chemical that preserves the wood. Things like decks, light posts, swing sets, mailbox posts, picnic tables, etc., are often made from pressure-treated lumber. Common Defects: While we do our best to provide the best lumber possible, defects still happen, and are unavoidable due to the way the tree may have grown, or how it was machined. The most common defects in structural lumber are bows, splits and knots. Bows are when the wood warps on the end of the board, and continues all the way down. Splits are cracks in the wood that are usually at the end of the board and easily noticed. Knots are naturally forming spots on a piece of wood, and are usually not a problem. Don’t hesitate to mention a defect in your lumber, we will take it back and get you a new one with no problems.